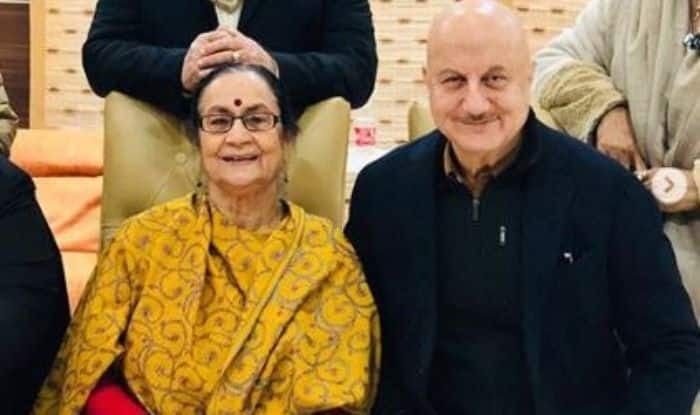 As the controversial movie, The Accidental Prime Minister, hit the screens today, lead actor Anupam Kher shared his mother’s response after seeing the movie and it was a brutally honest one. Not caring a tuppence about her son’s reputation, the veteran actor’s mother mocked his acting in the movie, her first sentence being “Aise koi acting karta hai? (Is this how one acts? )” and mimics Anupam’s rigid posture in the movie while portraying Dr. Manmohan Singh‘s role. Liking the movie as a whole, she did not shy from expressing her opinion of the former Prime Minister of India, Dr. Manmohan Singh and said that he was as innocent as shown in the movie. A happy mother, she rated the movie a 100/100. Sharing the video on his Instagram handle, Anupam captioned it as, “Mother of all Reviews: Dulari Watched #TheAccidentalPrimeMinister and has given her review in a One minute video. Her first sentence was frightening. “ऐसे कोई acting करता है?”. And she almost acted me out. But what followed was a great endorsement for my performance. Her observation about #DrManmohanSingh is spot on. Her review is my ultimate reward. After all these years Mom is relieved that I can act. Jai Mata di.  #DulariRocks#DulariReviewsTAPM #FilmReleasesToday” (sic). Helmed by Vijay Ratnakar Gutte, the film is based on a book by Sanjaya Baru with the same title. Sanjay was the former media advisor of former Prime Minister Manmohan Singh. In the film, Anupam Kher is seen essaying the role of Dr. Manmohan Singh while Akshaye Khanna is seen playing the role of Baru.